It’s truly remarkable that whenever we have a Conservative government, we suddenly witness media coverage of an unprecedented rise in the numbers of poor people who have suddenly seemingly developed a considerable range of personal ineptitudes. We see a proliferation of “skivers” and “scroungers”, an uprising of “fecklessness”, and apparently, the numbers of poor people who suddenly can’t cook a nutritious meal has climbed dramatically, too. We are told that starvation is not because of lack of money and access to food, but rather, it’s because people don’t know how to budget and cook, according to the Conservative Baroness Jenkin of Kennington. She recommends that poor people eat porridge, since it only costs 4 pence a bowl. The alarming rise in numbers of adults who have suddenly forgotten how to cook and eat porridge since David Cameron took Office, up to last year. The very fact that people suddenly and worryingly forget these life-skills under every single Conservative government, but most particularly under this one, provides a darn good reason to vote them out on May 7th, 2015, I should say. Meanwhile, I’m delighted to see the rise in sanctimonious wealthy people preaching Victorian values of thrift, self-help and morality, but only to the poor, of course. We really must learn to manage how to not have the basic requirements for survival better, after all. Poor people are just so incompetent at being poor. I’ve written a full and fitting tribute to the ideas of Baroness Jenkin and Iain Duncan Smith here: Poor people are rubbish at being poor, says Iain Duncan Smith and Conservative Baroness Jenkin of Kennington. However, here are two non-satirical, recent reports that highlight the structural and circumstantial reasons why people are starving and needing to use food banks, all of which are a consequence of Conservative policies. With thanks to the Child Poverty Action Group. Visiting a food bank is a last resort: we all hope that if times get hard, the safety net is there to make sure we aren’t left without the means to buy food for ourselves or our family. 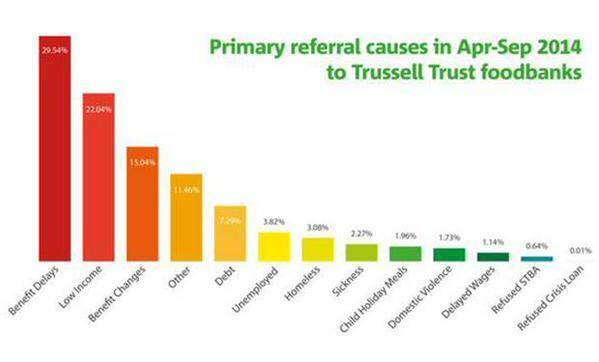 Yet research from the Child Poverty Action Group, Oxfam, Church of England and the Trussell Trust has found that failures in the social safety net itself are most often the trigger for food bank referrals. The report says that, while money is tight for many reasons, including bereavement, relationship breakdown, illness or job loss, issues such as sanctions, delays in benefits decisions or payments or being declared “fit for work” led people to turn to food banks for support. Other factors included loss of income due to the “bedroom tax” or the benefit cap. People interviewed for this research turned to food banks as a last resort, when other coping strategies had failed or were overstretched. Deciding to accept help from a food bank was often difficult, and was described by participants as being ‘unnatural’, ‘embarrassing’ and ‘shameful’. 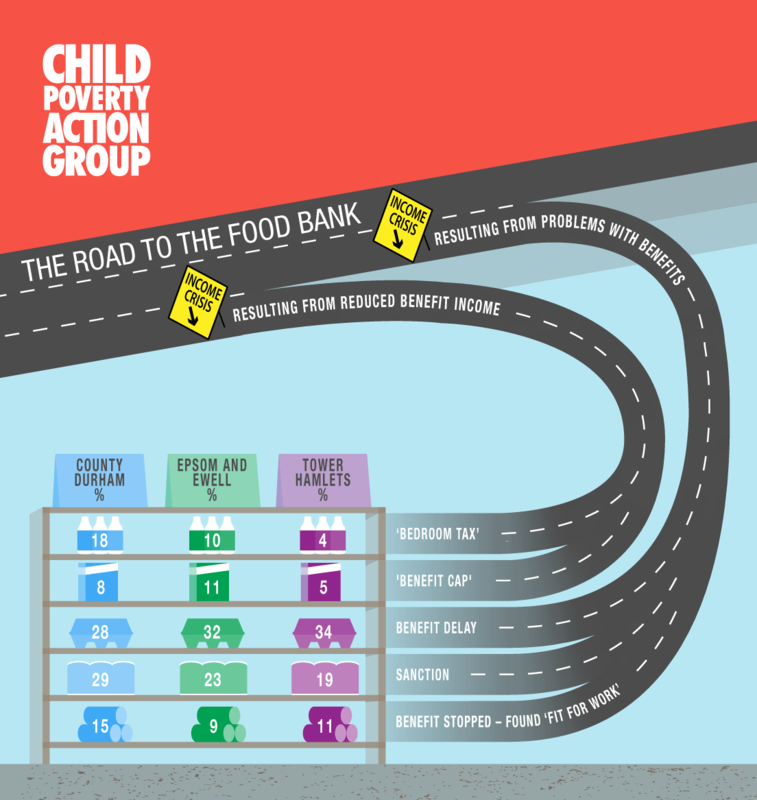 Most food bank users were facing an immediate, acute financial crisis – either a complete loss of income or a very significant reduction in their income had left them at crisis point, with little or no money to put food on the table. The acute crises people faced could be prompted by a sudden loss of earnings, or a change in family circumstances such as bereavement or homelessness. However, for between half and two-thirds of the people included in this research, the immediate income crisis was linked to the operation of the benefits system (with problems including waiting for benefit payments, sanctions, or reduction in disability benefits) or tax credit payments. The emergency support available to people at a time of crisis was not sufficient to prevent them having to turn to a food bank. Many participants were not aware of the various emergency payments available in different circumstances, and even fewer were receiving them. Only half (or less) of the users we spoke to knew they could seek support from the Local Welfare Assistance Scheme; very few of those potentially eligible had been awarded short-term benefit advances or hardship payments. Read the Executive Summary of Emergency Use Only Report. Download the full report: Emergency Use Only. Just about surviving is the third report from a longitudinal project: it’s part of a broader, ongoing qualitative study of the cumulative impact of the Coalition’s welfare reform in the London Borough of Newham. The study has revealed that far from encouraging people on benefits to move into work, the draconian Coalition welfare cuts have pushed many further from employment. The report says that the state has reduced welfare support to the point where it barely enables people to survive. Furthermore, by forcing people into stressful situations where day-to-day survival becomes a pressing priority, the “reforms” (that are, in reality, simply cuts to people’s benefits), which were hailed by the Conservatives as a system of help and incentives – to “nudge” people into changing their behaviour so that they try harder to find work – are in fact eroding people’s motivation. In other words, the reforms have deincentivised and hindered people looking for employment, achieving the very opposite to the intent claimed by the Tories, to justify their draconian policies. The report states that people are caught between trying to escape welfare reform through poor employment alternatives and feeling trapped in poverty. They move in and out of low paid work – susceptible to shocks and unprepared for the future. Careful balancing of budgets and borrowing money from family and friends has enabled some to stumble through, but others are increasingly paralysed in unsustainable situations, facing unfair multiple challenges which they cannot resolve. And just let me clarify here, it’s through no fault of their own. 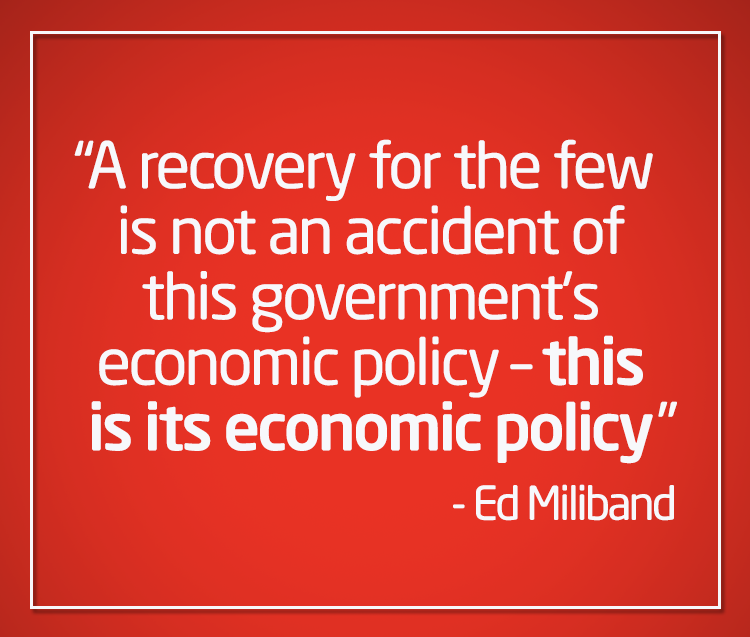 Poor people did not formulate the policies that are making them poor. The study reports a “culture of fear“, especially among those with serious disability or illness, who were unable to work and so felt powerless to escape or offset the financial losses causes by welfare cuts. Most people who were interviewed told researchers they both wanted to work and saw benefit in working. The report calls on ministers to provide more help in getting people into work, and criticises the lack of compassion in the implementation of the reforms. 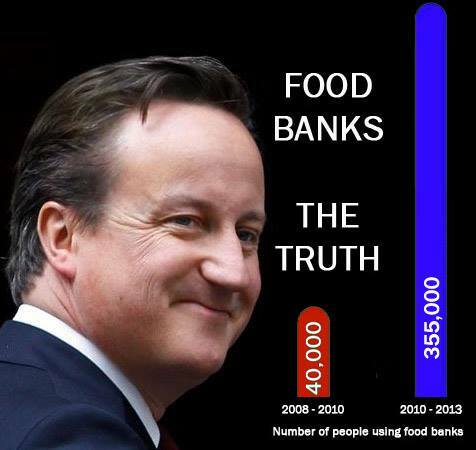 Latest foodbank figures top 900,000: life has got worse not better for the poorest in 2013/14, and this is just the tip of the iceberg – The Trussell Trust.